One of my close friends is studying abroad in Tokyo this semester (I'm very jealous) and I've been keeping up with her travels on Facebook. I was looking through her photo albums when I spotted really cute turtle-shaped melon pan in a photo of a Japanese bakery display. 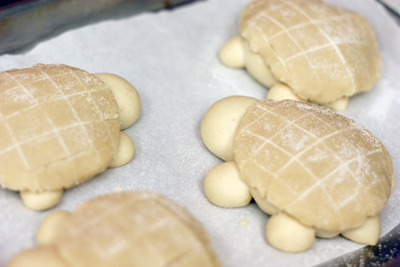 Next thing I knew I was on Google searching up a melon pan recipe as the thought "I must make turtle-shaped bread" ran through my mind. If you have no idea what メロンパン a.k.a. 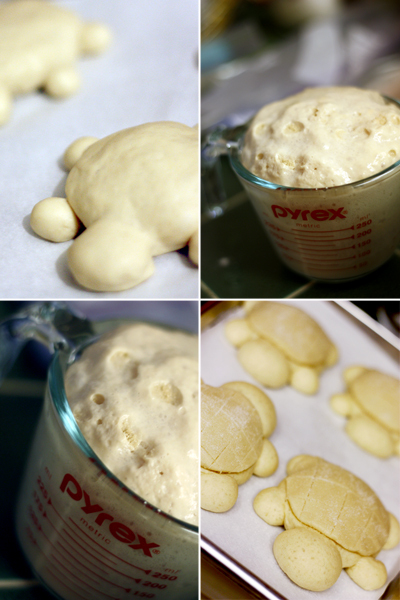 Melon Pan is, let me explain. First of all, in Japanese "pan" means bread. "Melon" refers to the look of the bread, not the taste (although some recipes add melon flavoring to the bread, but that's rare). 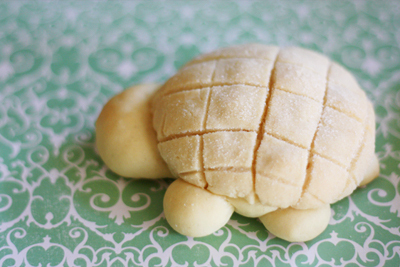 The criss-crossed surface is supposed to look like the rind of a rock melon/cantaloupe, but in the case of turtle-shaped melon bread, it makes the perfect shell. Melon pan consists of a lightly sweetened bread topped with a layer of sugar cookie dough, scored with the checkerboard pattern. I think melon pan is a close relative of Hong Kong's pineapple bun (polo bun), except the pineapple bun tends to have a softer bread base and a more buttery and fragile topping. Melon pan is delicious. 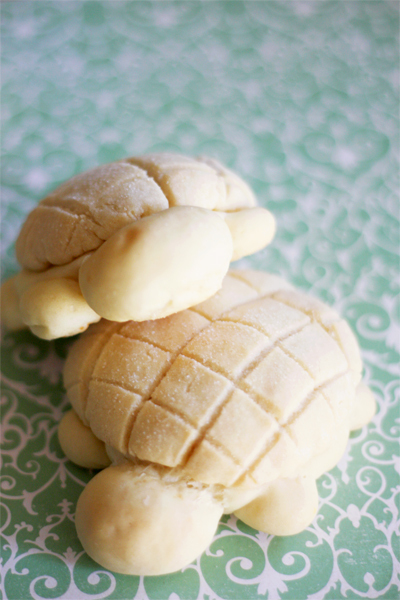 But, turtle melon pan is even better! Here in sunny California, fall isn't as dramatic of a season as it is in other parts of the country. 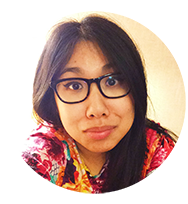 There is the occasional tree with orange leaves and a slight drop in temperature, but overall, outside, fall here is more of a gradual shift from summer to winter than a distinct entity. To compensate, I like to bring fall into the kitchen with a pumpkin here, a pumpkin there, plenty of apples, and a generous dose of cinnamon. For me, fall is a mindset I automatically fall into when school starts late August/early September. Once that time of the year hits, I start craving "autumn foods" like: warm apple crumble, moist pumpkin bread, and homey vegetable soups. Especially with Thanksgiving right around the corner, I seem to have pumpkin on my mind. 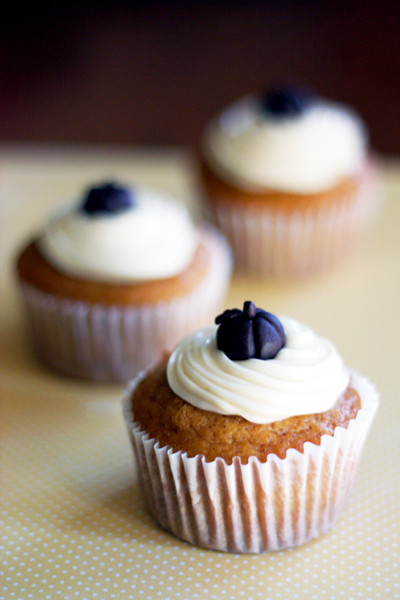 So let me share with you a lovely pumpkin cupcake recipe. Last fall, I spotted these adorable chocolate pumpkins on the blog Cake on the Brain and knew I had to learn how to make them. I clicked on the link and learned about the amazing substance known as plastic chocolate. It's made from only two ingredients and tastes like a grown-up Tootsie Roll: soft and chewy and as sweet or as bitter as the chocolate you use. Of course after making all those pumpkins, I needed to decorate something with them. 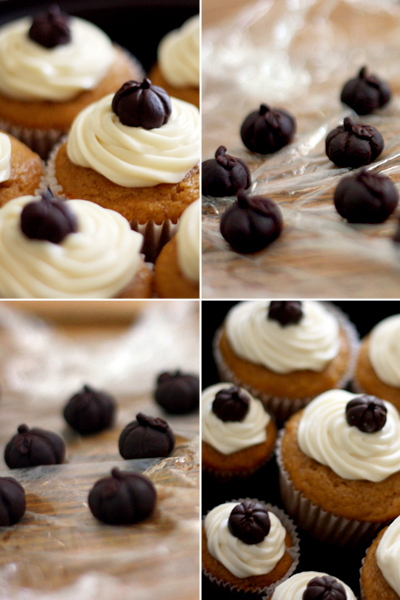 To fulfill my fall-induced pumpkin cravings, I baked up some moist pumpkin cupcakes, frosted them with a cream cheese frosting, and then topped them with the chocolate pumpkins. They were well-received by my friends and family, and thus a new autumn tradition was born.